I’m back, after a long, long sabbatical from blogging, to start a new project. 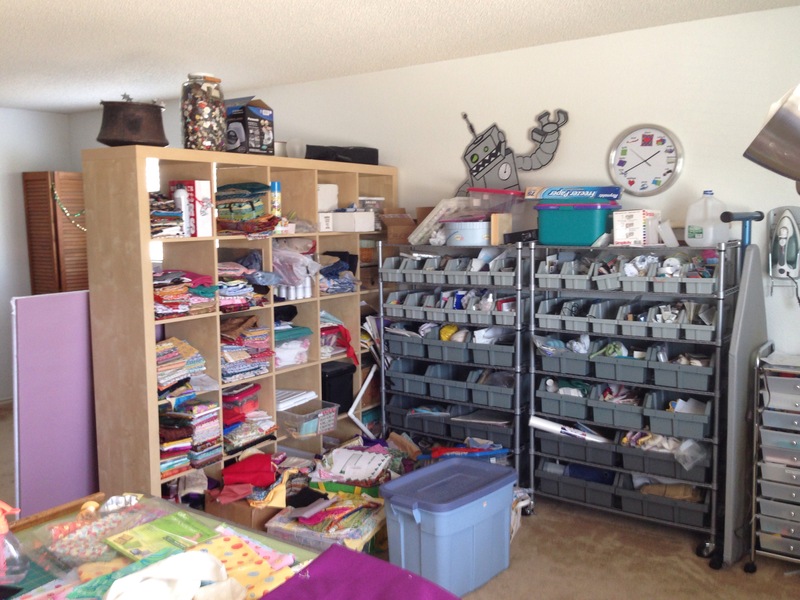 As a quilter and an artist, I tend to collect (hoard) things. Most notably, I have an affinity for books. My library. 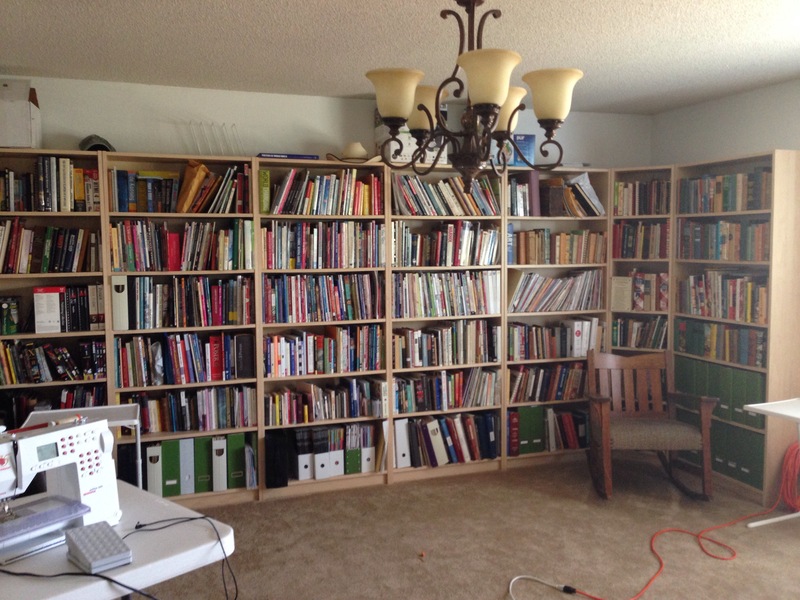 About three of these bookcases are stuffed with quilting books and magazines. My fabric stash is at StABLE (Stash Acquisition Beyond Life Expectancy) level, as well. …and on the worktable. Please do not disturb Pauline. He is testing my fabric quality. This is my baby, custom made for me in the USA. I even chose the color. No pets allowed in this room! as well as a part time job at a machine dealership. This part-time employment has allowed me to acquire even more stash and books than before. Well, in order to prevent a Hoarders intervention, I have decided that I must make at least one quilt from, or inspired by, each book and pattern I have. If there is nothing in the quilt book that is helpful or inspirational to me, it is going on the FREE table at one of the guilds. What you will witness, Readers, is my progress (or lack thereof) through this project. All books must start in the library. This part has been accomplished, I believe. Any book can be saved by either virtue of technique or by pattern use. Since I have never completed a pattern as written, this will have to be a loose interpretation. 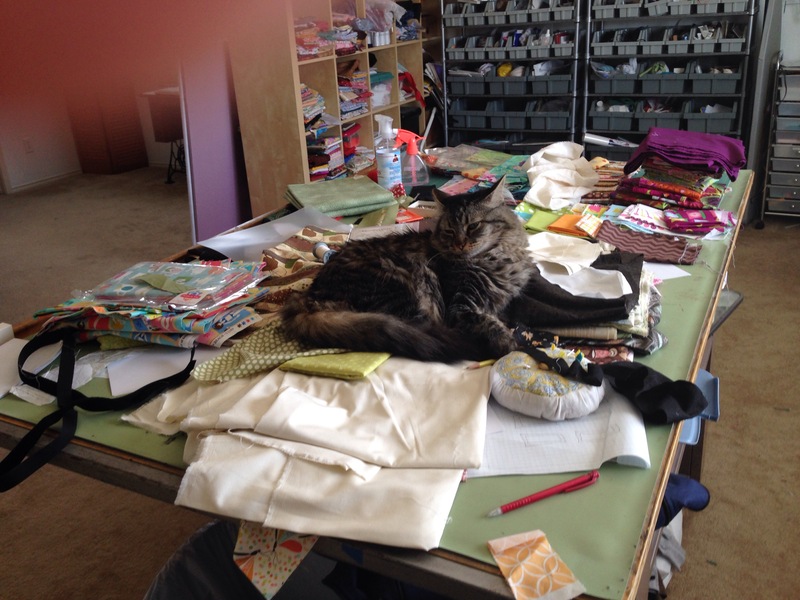 Each quilt must use *something* from my stash, even if it is batting or the fabric for the quilt label. Hopefully, it will be much more than that in most cases. Completed means Completed. Bound, labeled, and ready for action. There will be off-topic posts. Love them, or skip them. I made the rules, and I can break them. I am Supreme Ruler of my own blog posts. MUAHAHAHA!!! Join me, if you wish, and share your progress! There will soon be a facebook page and flickr group dedicated to the project. Considering where I am starting, I will never run out of blogging material again! 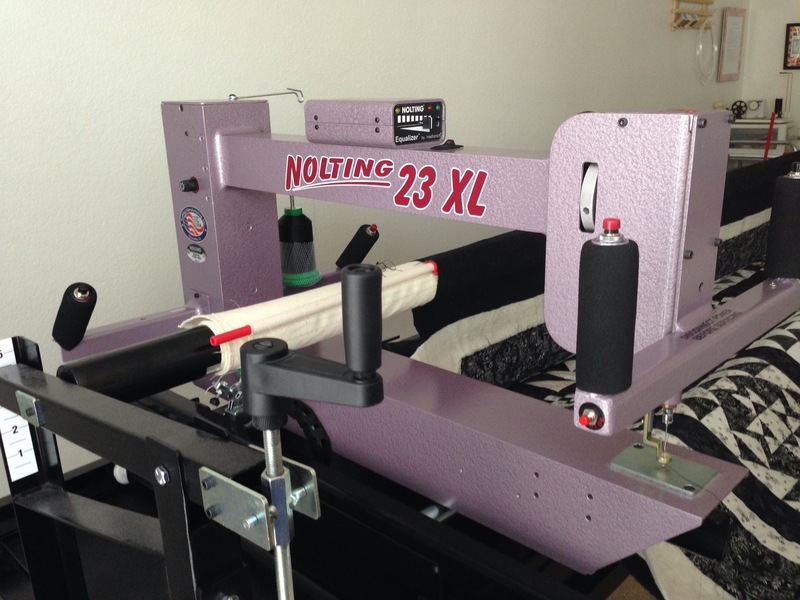 This entry was posted in Quilting, sewing, Uncategorized and tagged fabric, funny, Humor, quilt, Quilting, Sew, sewing, stashbusting, studio, Textile, Work in Progress. Bookmark the permalink. Ambitious but you will achieve the goal. Hey, if it was me I would add to the list…if it is not fun, get rid of it! Great rule for life as well! Hmmm, interesting. Will this help you cull books/magazines? Or is it just a “no more buying books/magazines, all quilts must come from books I already own”? Just made my first ever completely from my scraps quilt. It felt … mmmm … liberating! Will have to come up with more. I’m hoping that it will, Robin. If I pick up a quilt or magazine and find nothing useful or inspiring inside, it’s leaving. I have acquired books and mags not only through stores, but also from friends and estate sales, by bulk. And some are just plain disappointing. Have you created the FB page yet for this clearing out the useless stuff project? ?